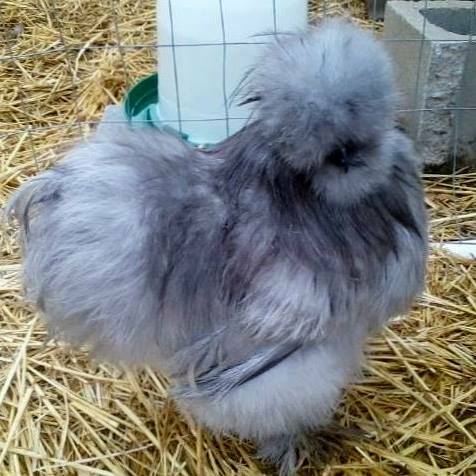 The Bearded Self Blue Silkie Bantam breed information, appearance, personality, This breed is now an accepted breed by the American Poultry Association as of Dec. 12, 2010. The color for the males and females is the same. Comb, Face, & Wattles: Deep mulberry. Beak color: Slaty blue to black. Eyes: Black. SHANKS AND TOES: Slaty blue to black. ​Plumage (Feathers): The entire surface an even shade of light, slaty blue, free from mealiness, cloudiness or mottled appearance. Birds with these colors would be disqualified as Bearded Self Blue Silkie Bantams: ​Red, yellow, orange or positive white in any section of plumage (2). ​Personality: Docile, easily handled. (Just as sweet as they are cute) but this depends alot on how the bird was handled and treated since hatched.